Performance Professional | Tutima Glashütte/Sa. Performance Professional - Tutima Glashütte/Sa. The robust M2, made in Glashütte, continues the tradition of the Tutima Military chronograph able to perform under the harshest conditions. 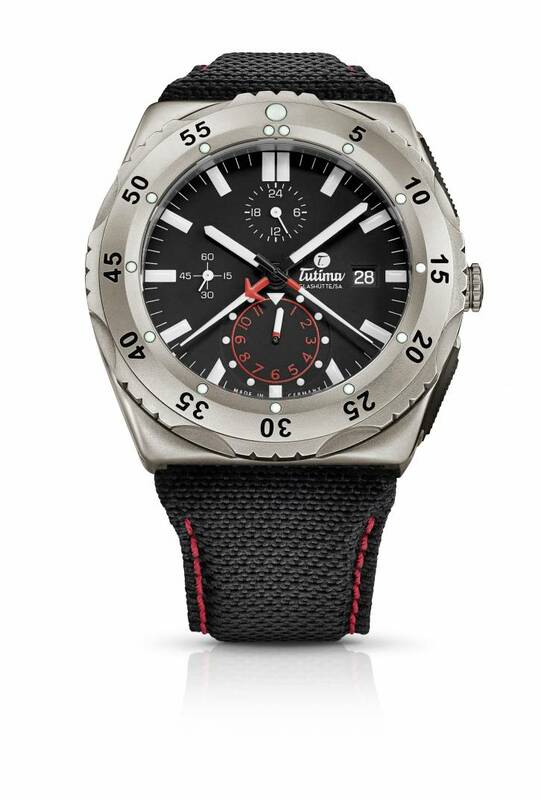 What can shock a watch that follows in the footsteps of the successful Tutima NATO chronograph, the official service watch of German army pilots? With this new version, introduced at Baselworld, the watch manufacturer from Glashütte even outperforms its tried-and-tested principles of highest functionality. The star attraction is the M2’s chronograph movement: it differentiates itself in its large sweep minute counter. The modified dial train as known from the Military is a protected, proprietary Tutima development and guarantees optimal legibility for the counted minutes. In-house Caliber Tutima 521 is based on an ETA Valjoux 7750 and given its finishing touches at the brand’s Glashütte manufacture. It is securely housed in a solid case made of pure titanium outfitted with an additional inner core made of mu-metal, a magnetically soft nickel-iron alloy that doesn’t allow the effects of magnetic fields to even reach as far as the movement. It is topped off with a strong sapphire crystal that is anti-reflective on both sides. Nighttime is even something that the M2 beautifully masters: the hands displaying both, the time and the chronograph functions, as well as the hour markers, are coated with Super-LumiNova. A striking distinguishing feature of the Pioneer model variation is the easily gripped rotating bezel with 14 luminous capsules, which make the set timing intervals clear and easy to read even if it is fully dark. The M2 is a timepiece that always provides more functionality than expected. This is proven by a closer look at the version that comes on a titanium bracelet: the model is delivered in a box that contains an additional, ultra-robust Kevlar strap as well as a set of tools for changing the bands. With this new highlight in the Glashütte collection, which made its debut at Baselworld, Tutima offers a reliable companion for strong personalities. 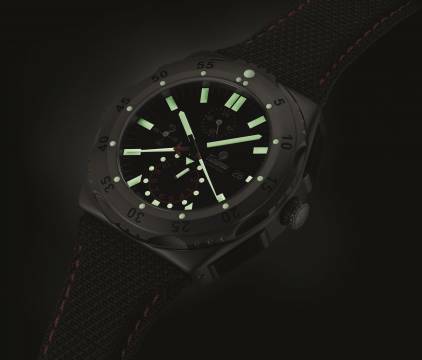 Model variation M2 Pioneer is reliably easy to read even in the dark: the easily gripped rotating bezel is outfitted with luminous capsules and a large reference dot at 12 o’clock.